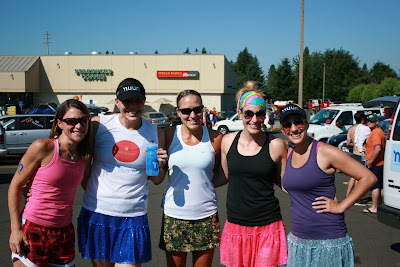 Before Hood to Coast I didn't "know" anyone in my van. Melody HERE and I had been Virtual friends for years, but beyond that I had the opportunity to make 6 new friends. Going in I thought we would have more interaction with Van #1 of our team, but alas we rarely saw them :( I can tell from all the AMAZING photos that Emily HERE took that they had a blast!! We set out around 8:00AM and our van wouldn't start at first..UGH!! Thankfully second try and we were off. Kelly HERE immediatly got to work on Twitter, I am not on Twitter but IF I decide to join I know who to call for advice, this girl knows EVERYTHING. The Van started out bouncy, but leveled out once we got out of Seattle. It was an overcast looking day and reports on Facebook said there were storms on the Mountain. We all meshed so well, laughed and had a blast. I learned so much from each person. 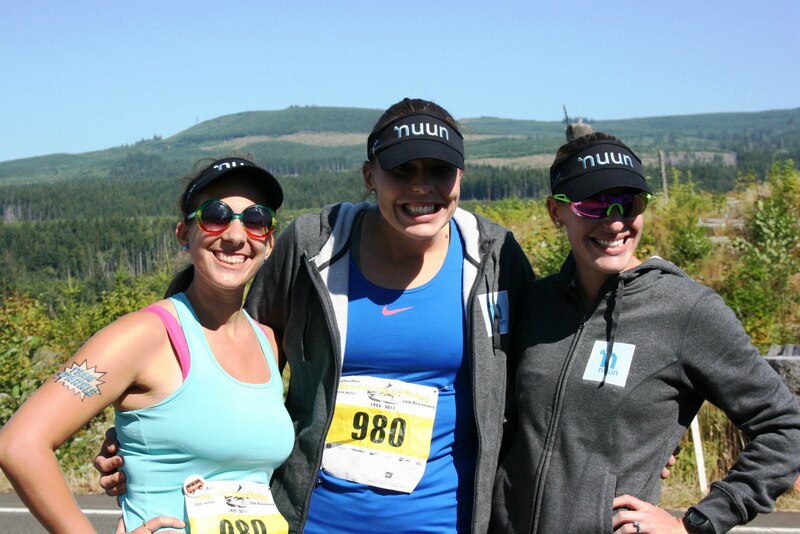 Jen-Our Nuun staffer is a tough Adventure racer who LOVES her girls. She chuckled at me as I complained about being dirty and having "the Black lung" after my night leg. Kelly- Got sent to Twitter jail early in the trip :) She was super organized and gave us little contact lists to help us with Tweeting and recognizing our sponsors. Trouble was once we got going we had no Cell service, made it a little difficult to keep people up to date on our progress. Megan- Megs was the quiet one in the group, eventually we got to talking and she told me that she started her Blog so she could be a part of my Tall Mom 1,000+++ club. I was FLOORED that I inspired this amazing woman to join the Blog Community. I played Mom to Megan when she was not feeling well and she reciprocated by brning me water after my legs and taking pictures. Melody- I have been reading Melody's blog for ages so I sorta knew what to expect, what I didn't know what that we would totally click. "The Mel's" as we were coined in the van because it was super confusing along the way, handing off the bracelet to Melody was awesome, I knew that even if I was a little slow Melody would make it up with her Supermodel Speed.. We joked along the way about having nicknames like Speedy Mel, Pretty Mel, Silly Mel, etc.. none of them stuck but it made for fun banter. At one point I had to grab her a$$ to keep her from falling out of the van.. LMAO!! "I feel like I am hogging the Taco." Of course talking about the Taco Costume, but I could not get the innuendo out of my head. "I need to grab something out of your Taco." "The Taco is getting hot." I cant remember the others, but seriously funny. While Hanging we got the PLEASURE of meeting Amanda HERE (next to me in the photo) and her husband. LOVE LOVE them!! I hope to see Amanda again when we have more time to talk. At this point I was ZOOMING around and starting to get a little Hot. We did get to See Dead Jocks in a box, which was really cool..
Lauren HERE came flying in and we were off..
Jen was first and it was HOT, she flew through her super hot leg and handed off to Carrie, she carried the knuckle light although it was not dark yet and she chicked a guy when we stopped to give her water. 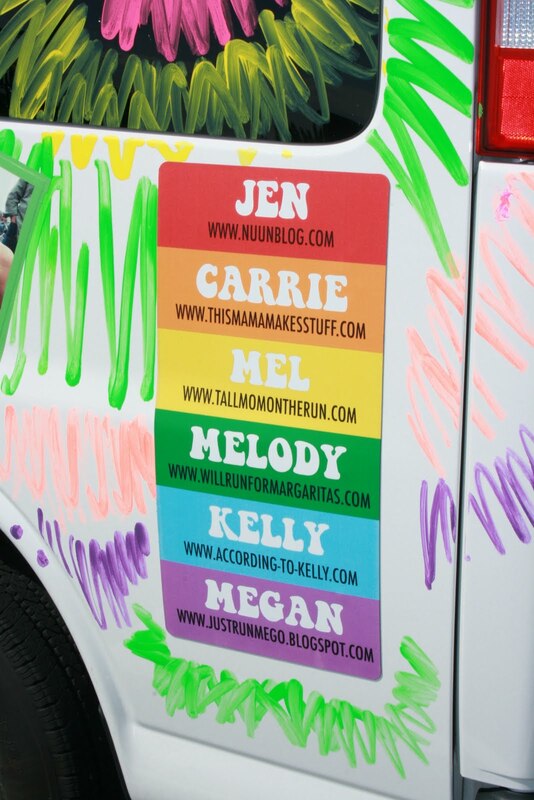 Carrie handed to me, me to Melody who cruised on the secluded trail, Melody to Kelly who puked and got stopped at a few intersections and Kelly to Megan poor Megan was in the Honey Bucket when Kelly showed up oops...Megan brought it home to Portland. After the first transition in the DARK DARK and creepy Bridge in Portland we went to look for food. I started to feel REALLY SICK, and wanted so badly to puke... from then on I struggled to keep focused, took hardly any pictures and just wanted to be out of the van. We made our way to the next major transition, I had a little tiff with our "Van Guest," we laid down our tarp and sleeping bags.. Under the stars, with the volunteer yelling encouragement and directions in the background. knowing that runners were out there moving keeping the relay going while we rested to prepare for our next CHALLENGE!! It was surreal, I was so comfortable, in the middle of a field, how was that possible? I could have slept there all night, but I knew we only had about 2 hours. Poor Megan was not feeling well so I played Mom to her, and cleaned up the van before we set out. Somehow a thing of Barney Butter exploded on the package of Salami, I was rather DRAMATIC in hiding it from Megan it was pukeilicious.. I tried to get out of the van at EVERY transition and bring the runner coming in water or grab her sweatshirt when she set out. I HIGHLY recommend doing this because it makes you feel more connected to the team. I wish I would have taken more pictures because the middle of the night stuff was pretty COOL!! Jen set out up a hilly route, we cheered for her and Jess on that leg. Next was Carrie who was to climb a mountain one of the HARDEST legs on the course, pass to me for a dusty hell run, to Melody up a small hill then zoom on pavement, to Kelly as the sun was coming up and off to Megan to bring it home to the Mist and pass off. The MIST!! WOW the Mist was BEAUTIFUL.. We got to see Van #1 who had to sleep in their Van, poor girls looked tired. Our Van Driver Ken scored some coffee and said "Word" made me chuckle. The traffic had been HORRIBLE so we did not wait long once Megan arrived, for fear we would not stay ahead. We got to the next Transition after HOURS of Traffic. We had a little rivalry with the Kilt Guys and at this transition one of them asked me to help use hit stick on his legs.. HMMMM no thanks!! WEIRD.. After cleaning the van, using the facilities and getting changed we headed out leaving Jen behind to beat the traffic. It was hard to know when Van #1 would arrive with radio silence in the Mountains. I sat in the shade with Carrie while we waited.. 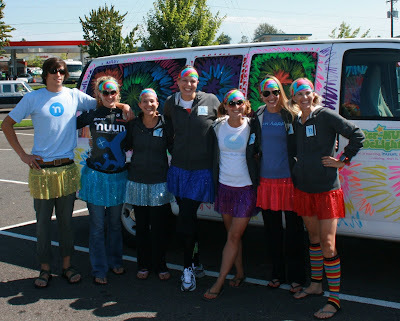 Saw Van #2 from Nuun Platuun pull in, they had taken the lead and soon Jess would arrive. I got up to Cheer on my friend as she had done for me, in came Jess, but there was NO RUNNER!! I was upset for Jess who had clearly run HARD....I ran to the Nuun Platuun Van and said, Jess in waiting!! 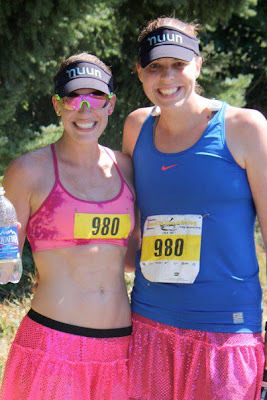 Kim came running out and I handed Jess my water, I was GLAD To be there to help my good buddy..
Jen came looking strong, and passed off to Carrie for a 5 miler, we were not sure we would beat her to the next transition. Melody kept talking about her 3 miler and I was NERVOUS for my nearly 8 miles, so I tried to chat with Kelly who also had 8 miles. The sun was coming up, I was getting nervous for the traffic so I hopped out of the car with Melody to the transition. There was an Ambulance and a lot of caos, in came Carrie and I was off.. Up the hill and pass of to Melody for her SPEEDY 3 miles. 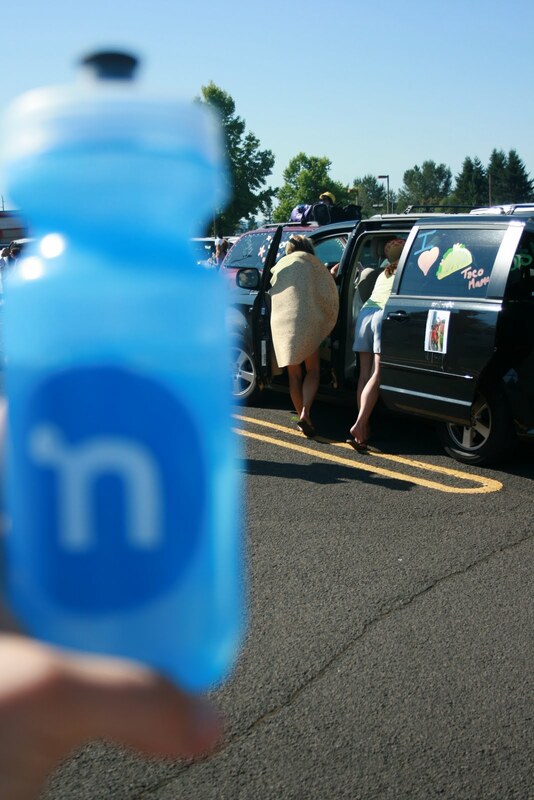 We stopped to hand Melody water as I told Kelly how awesome my leg was. 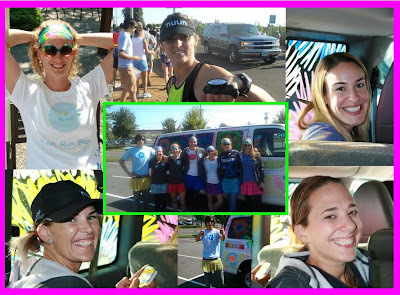 Melody passed to Kelly, who set out for the LONGEST leg on the course, we stopped often and caught a couple pictures.. 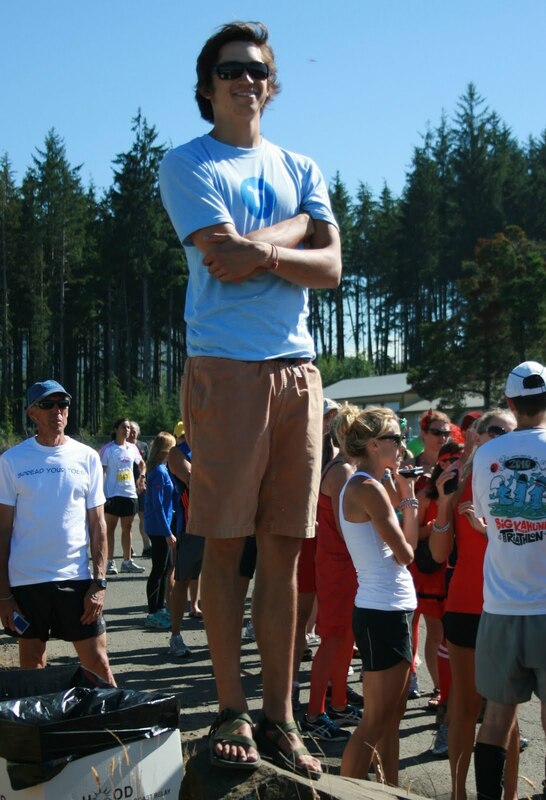 I was really happy to be done...and cheering for Kelly. We saw T a couple times and gave her what she needed for her shredded quad. Kelly was not far behind and killing her leg, we got to the transition. So hard to believe that this was leg #36 and we would be done.. Ken, our fearless leader was on a rock looking for Kelly to come in. In came Kelly who passed off to Megan. We quickly realized there was no way that we would make it to the Finish line before Megan. I started to tear up, sad that we would not be there for her after all we had gone through :) Ken got us safely to our destination and we found the rest of the team.. To be honest I was WORRIED when I saw that a "kid" would be driving our van, I felt like we drew the short straw. I reserve the right to be proven wrong and boy was I ever, Ken is STELLAR!! He lead the way with little help, kept his cool and was always smiling. He got very little sleep but never once complained. When we finally parted ways he seemed like he didn't want to leave us, I think he got used to taking care of us. We went in for a group hug and are now facebook buddies..
More about the After-antics soon. THANK YOU to my teammates for such a great adventure.. I started pulsing some of my favorite brands for supplies and gear, a few came through!! I ordered the SWEET Champion Sweatshirts for our team and had them printed. Below are our Sponsors. THANK YOU THANK YOU!! The Staff took amazing care of us, gear, hotels, food, drivers, encouragement, and anything we needed. I cannot say enough about this company and the product. I was SAVED from cramping by Strawberry Lemonade. I will have a full post about Nuun soon. For now my deepest Gratitude!! 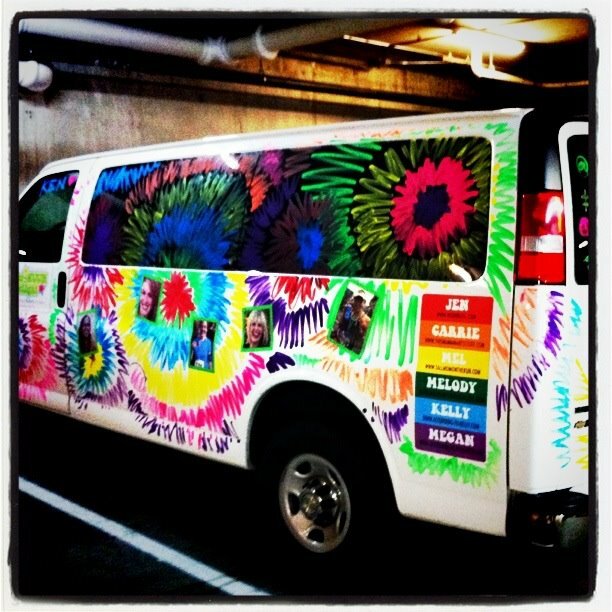 Our van Looked AMAZING! 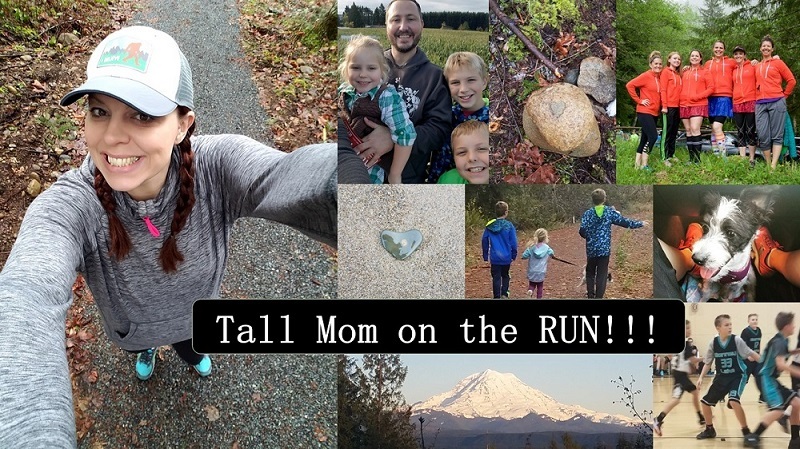 I think that Buildasign should partner with Hood to Coast because these magnets are fantastic. We had Nuun logo, tubes photo, Afternuun Delight Logo and our team Blog list. Working with Buildasign was AWESOME, they have quality products. 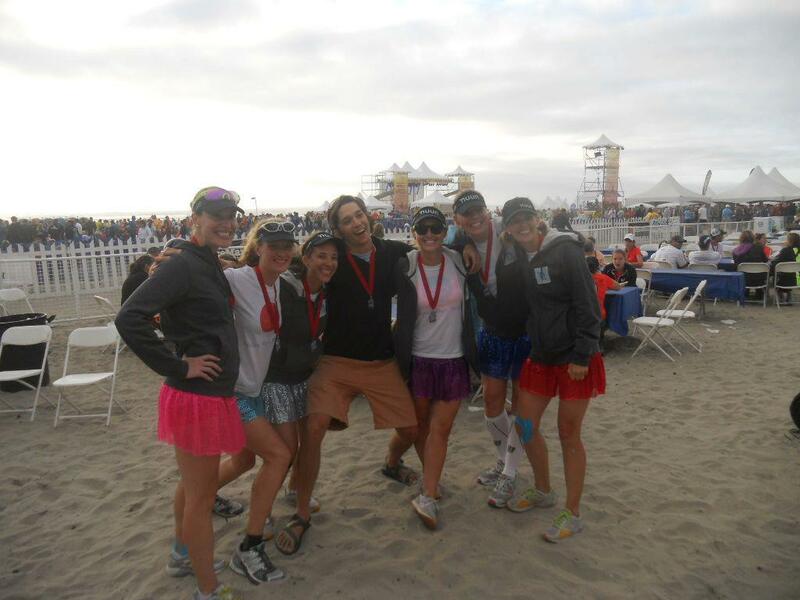 These skirts were the saving grace for our team. We were super easy to spot during the day and at night. 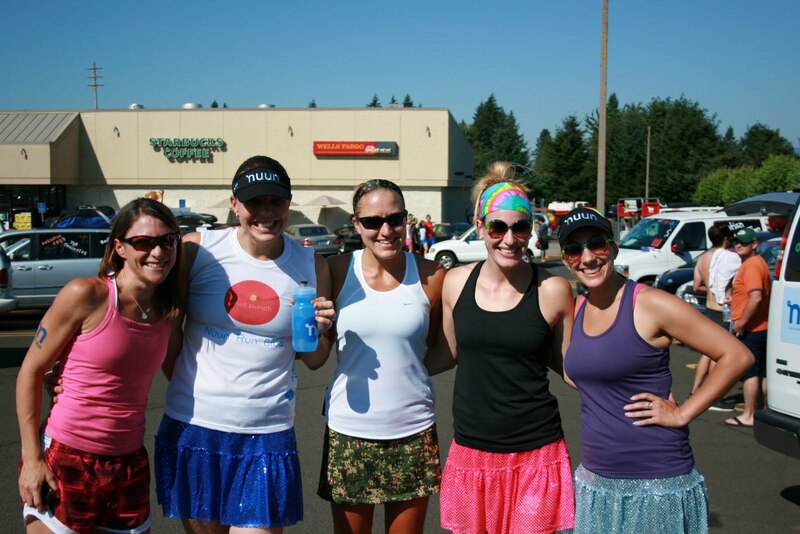 We looked sharp and were recognizable along the course. Plus passing guys while wearing a Sparkle skirt is pretty cool!! This local company is awesome! I for one am a Sweaty beast and used my Towel to clean up between legs. I was sent Knuckle lights to test. I will have a full review soon. We ended up handing off the knuckle light through the dark legs, I LOVED it to see the road and control my light. GREAT product for relays for sure. I didn't try this along the course because I felt so Ill, but I heard that Dorothy HERE is a fanatic and consumed all the single serves in her van. Body Wipes are a must, this was my shower along the course. Felt great on my face and had a light and refreshing smell. WOW that was long, thanks for hanging in with me. I had every intention of taking notes and pictures so I would not miss a thing..In my mind it is a jumble of hard, crazy Awesomesauce... This WILL be an annual event for me if I am lucky..
For feeling sub-par your mind sure is sharp!! SO THANKFUL I could see you throughout this adventure Mel! You are a blessing and am I so thankful to call you my friend. You continue to pay it forward! 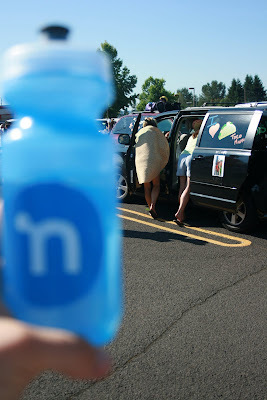 Love the NuunDelight Van2 so glad to live vicariously through your blog!! Hugs to you all! Awesome post!!! Sounds like you had a great set of sponsors and amaing women to run with! love, love, love!! so glad we are no longer virtual friends - but real life friends!!! Great recap!! I love that van. So colorful! And the Sparkle skirts... too cute! Thanks for sharing the experience! Oh no... Pumped up Kicks is now stuck in my head!! Such a weird and violent song! Love the recaps!!! You guys are all amazing and so very inspirational! Love your recap! Sounds like an experience of a lifetime!! You remember so much detail! Seriously, were you taking notes?! So neat that you got to meet so many awesome new people and really make the most of this incredible experience. Haha.. "the Barney butter exploded on the salami.." that's what she said. Sounds like so much fun! Tough, but fun! Makes me want to get on a team for next year! Congrats on an amazing race!!! !